A client has come to Moore & Bradfield asking for a kitchen design which incorporates a French farmhouse feel. After a bit of a head scratch, I have compliled another set of top tips...Enjoy! 1. Consider classic colour palettes, blues and sandy neutrals, pale greys and lavanders and pale sage greens are all very chic. Rough stone walls, painted white or left natural are also a beautiful addition. If your kitchen lacks the real thing, you can always cheat with some stone effect wallpaper. 3. Don't be afraid of accessories. 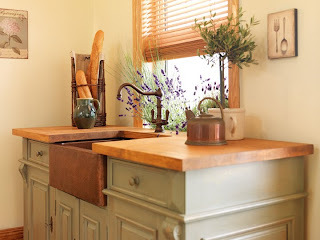 Recreating the chram of French farmhouse style rests on the right detailing. Think rustic painted furniture, wire baskets, traditional painted textiles and gleaming copper pans and sinks. 4. In classic French kitchens, everything is out on display. Open shelving is a great way to make a feature out of well used and well loved china. (Try to stick to pottery as opposed to porcelain, it will look much more authentic). 5. As for lighting, it has to be a classic rise and fall light. Chandeliers are another more opulent option, but for a rustic edge keep them distressed.